As a mom to 6 kids at home and 1 who visits, a lot, Im always looking for things to make life just a bit easier. So when I was sent this 4-in-1 for the potty, I was stoked! Less work for me YIPPEE!!! 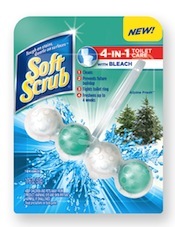 The new Soft Scrub 4-in-1 Toilet Care is available at Walmart for less than $2 and freshens up to 4 weeks. It attaches easily to the side of the potty and even tho it doesn't look snug, it is! As of now its withstanding 2 5 year olds who love to flush the potty even if they don't use it! The Soft Scrub Brand provided me with a full sized product sample of Soft Scrub 4-in-1 toilet care in exchange for my review. All the opinions I have expressed are my own. Soft Scrub is also hosting 2 sweepstakes. Here is the link. You can also use the link to sign up for their special offers and emails. Enter the copter below for your chance to win 1 of 2 coupons for a FREE Soft Scrub product! Best bathroom cleaning tip? Borax. It will make your tub sparkle! Wow - I am a terrible housekeeper, so my best cleaning tip is hire someone to do it for you. I use newspaper to clean my windows and they are streak free! Mr.Clean magic erasers work great for taking crayon off of walls. bleach! Wear a mask with it, but it cleans everything great! I use newspaper to clean the windows & mirrors. an easy mixture of vinegar, lemon juice, and water leave floors looking shiny and clean! also, a flat-head screwdriver with a towel on top can clean grout and in-between tiles and crack of dirt and small pebbles! I love Borax. It cleans EVERYTHING! I love that I can add it to laundry! I love mixing it with vinegar to clean my tile in the bathroom! Use more vinegar in your cleaning! Magic Eraser and clean up little each day! Clean as soon as the mess is made. Clean when you're stressed or anxious to take your mind off things and so it doesn't even feel like work! I buy Vinegar by the gallon and use it to clean everything! It works great in my front loading washer - I had a cup when I wash towels and it keeps it clean, smelling good and keeps my towels smelling fresh too. I use it to clean my toilet bowls - our water has a high iron content and I pour a little bit every couple of days to keep it clean. It keeps my stainless steel clean and sparkling and works great on my windows and glass too! Flush drains with bleach once a month to fight clogs. My best tip is to use toothpaste to clean and shine up your fixtures! Never mix bleach and ammonia lol Thanks for the giveaway! If all else fails, hairspray helps take out clothing stains! The thing that has served me best throughout the years is this: Clean one room really good, every single day. Just one. This way, the whole house stays cleaned but I am not devoting my entire life to it & I don't dread it. Start cleaning from top to bottom, that way, I don't everything settles on the floor to sweep up. My best cleaning tip is preventative. Leave shoes in the garage or by the front door and you won't track dirt in the house. Dirt you don't track in means you don't have to clean it up! I'm a terrible housekeeper! My only tip is to vacuum every day - it makes a big difference, even with clutter around! I use lemon juice to remove rust and stains! After you mop dump the water into the toilet. I normally use bleach and pinesol when mopping so it does help to clean the toilet as well. Vinegar for everything! We made an awesome jar of citrus rinds and white vinegar for general cleaning. It works great and smells fantastic! I had not used Borax until about 2 months ago and SO glad I did. It is the best tub cleaner ever!! I use magic erasers to clean stains from my tub. Best tip- use Oxy clean to clean tile and grout. Works awesome. I love to use white vinegar for cleaning. It works well and is so cheap in the gallon form. I like to soak the shower head in the white vinegar to clean it. Scrub lightly with an old toothbrush to remove mineral deposits. I use old toothbrushes to clean around the sink fixtures, handy. I use vinegar to clean a lot of surfaces! I would just say to follow the directions on the bottles! I stink at house cleaning !! I microwave a bowl of water and lemon juice to clean the inside. I scrub the floor of the shower using a sponge with my feet. Clean windows on cloudy days. If it is sunny, the windows will streak. Start from the top of the room and work your way down. Thanks! wiping down the bathroom immediately after a shower. Take it one room at a time, start at the top and work your way around the room. Its easier to remember what you have done that way. Keep on top of your cleaning! Try not to get behind.